ZTE is reportedly getting ready to release a new extra-large Android smartphone in the US. According to Venture Beat, the upcoming handset is called ZTE Zmax Pro, and is headed to T-Mobile. 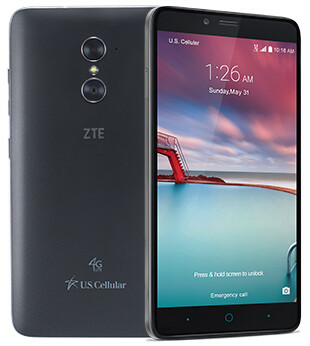 While T-Mobile carried the original ZTE Zmax (released in 2014), it did not offer the ZTE Zmax 2, which instead is being sold by AT&T (since 2015). The Zmax Pro will run Android 6.0 Marshmallow out of the box, sporting a 6-inch display with 1080 x 1920 pixels, and offering other mid-range features like an octa-core Qualcomm Snapdragon 617 processor clocked at 1.5 GHz, 2 GB of RAM, and 32 GB of expandable internal memory. It seems that the ZTE Zmax Pro will be relatively similar to the ZTE Imperial Max (recently released by US Cellular, and pictured above), with one major difference: instead of the dual rear camera that the Imperial Max is offering, on the back, the Zmax Pro has a regular 13 MP camera, plus a fingerprint scanner. There's also a 5 MP front-facing camera, instead of the 2 MP front-facing shooter of the Imperial Max. At the moment, both the ZTE Imperial Max and Zmax 2 cost $149 off contract, and we're thinking that the Zmax Pro could be sold by T-Mobile for under $200. The new device should be released sometime this summer. Interested? Ah, can't wait to have this phone to be able to sell, will go great to sub prime customers. The LG leon and Samsung Core Prime has lost their spark haha. Interesting. Too bad it's not 64/4gb though. For $150? Amazingly interested. Will buy on day 1.